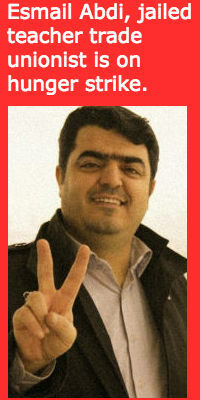 Esmail Abdi, leader of the Tehran branch of the Iranian Teachers’ Trade Association, was unjustly sentenced to six years’ imprisonment by Iran’s Islamic Revolutionary Court. The February 22 verdict came eight months after he was arrested while en route to Armenia to obtain a travel visa to attend Education International’s World Congress in Ottawa, Canada. In custody since his arrest, Abdi was charged with “gathering and colluding with intent to harm public order” and “propaganda against the system.” His colleagues say that these charges were prompted by his legitimate trade union activities and leadership role. Prior to Abdi’s incarceration on June 27, 2015, nationwide rallies were held to protest at the low wages that leave the majority of Iranian teachers below the poverty line. Education International calls for the immediate and unconditional release of Esmail Abdi and for the respect of the fundamental rights of all Iranian teachers.